What is product engineering and how does the approach differ from much of the engineering we're all familiar with. A recent Twitter thread this week from Charity Majors about product engineering triggered some thoughts of my own. I’ve talked a bit about “product, not project” before. For some background, these two blog posts give a good idea of what I experienced and saw, and reshaped my views towards operations engineering starting many years ago. The things that struck me when I looked at product teams at my former employer was there was no clear line between product and engineering. It was “product engineering”. 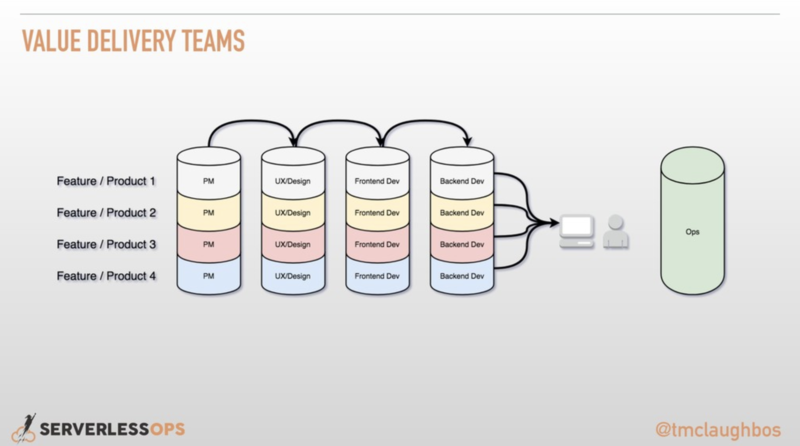 The product teams had devs (frontend and backend) and their own PM and designer team members. If you’ve seen me speak recently, that experience is where this slide comes from. Coming to this culture involved a rough transition period. Get it perfect and right the first time, which was how teams I was on previously operated, wasn’t possible. Here, you became a bottleneck or burned yourself out trying to be perfect. Everyone wants to do a good job but there were things I learned. Not just “done is better than perfect”, but good enough is just fine when you’re not sure if you’ve solved your user’s problem. This required stripping requirements down to the bare minimum for day one. Those bare minimum requirements are only the things that provide the most direct customer value. Then, ship what provides less direct customer value once your customers respond positively and you know you’re providing what they want. How does this all relate to serverless? We regularly talk about the engineering efficiency serverless provides. What are you going to do with the time your engineers have gotten back from not dealing with infrastructure? For many the decision will be to ship MORE features on day one. But I’m going to offer an alternative. How about don’t fill that time with more engineering work? Why not have your engineers spend time on a sales or customer call? Find ways your engineers can work more directly with internal users so they can better understand the problems they’re solving. What has excited me greatly about serverless is the engineering efficiency makes it easier for more organizations to adopt the style of work I first encountered several years ago. Now we just need to choose to make the most of it. Are you writing your Lambda functions in Python? Well then take a look at our latest blog post. This week there were a lot of great serverless blog posts plus so many AWS and product announcements. So we could fit everything we wanted you to read, we've condensed the AWS and product space announcements here this week. Epsagon let's you follow feature releases via a public changelog! Catch more of Slobodan Stojanovic being interviewed by Marcia Villalba too!